This my daily driver, a Yamaha 650 custom. I've done the j-slam changed the bars to z drag bars with batt grips, shaved the seat and covered with alligator, did the side mount taillight, everything I've done to the bike has taken less than 30 minutes each. I'm building a 78 Ironhead that will be my own take on what a custom should be. As money allows I'll get bigger engines and do more, but for now this is what I've got going. Thanks man the fender i finished the bike with is a harley softail widened 3" will post pics of finiahed bike the pic u see is stock i just cut the junk off. 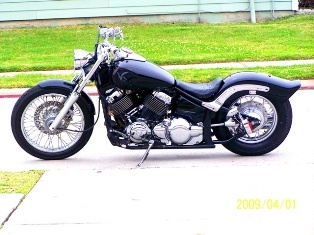 And slammed it.would reccomend if over 200lbs body weight with the j slam u will burn up that rear fender.the front forks all i did was shove them up 1"and 7/16. Every inch u lower the shock at top bracket " equals 2" at rear so watch it sit the bike on the ground and go up from there.i used a harley air shock and reversed it to make it work.frame almost on ground beacause of swingarm and frame.later joekustom let meknow if u need more info i tore the bike completly apart so if there is anything else holla. 040'from what the last owner told me but by the carb and magneto not counting on it will do an engine rebuild fortorque. And do my own thing with the rest itll be cool so pics are a must but chek me out ill be gone to south korea for 40"days but when i get back its on cause ill have 35 off.follow this one cause from what ive found the 69'is worth something well we will just what its worth done my way later joekustom. I live in Australia and am looking for a Yamaha 650 Custom Motorcycle. I recently googled Yamaha 650 Custom and your bike came up, i like what you have done with the bike. I was wondering if you can give me any advice. I like the fenders on the custom over the classic, how difficult is it to custom the rear fender, any advice would be great. Hey i love the Yamaha, what year model is it?